During class you start faster and deeper breathing. This increases the amount of oxygen that enters the bloodstream. Your heart beats faster, which increases blood circulation in the muscles and lungs. Your small blood vessels dilate and deliver more oxygen to the muscles, which helps to remove the wastes from vessels, such as carbon dioxide and lactic acid. Your body produces endorphins, natural painkillers that help to affect the emotional state and increase a sense of well-being. What aerobic exercises give your health? 1) getting Rid of excess weight. In combination with a healthy diet, aerobic exercise will help you lose weight and keep it off. 2) Increased stamina. Aerobic exercise can bring fatigue in a short time of practice. However, with regard to a long period of time, such training will give you a lot of energy, and you will tire quickly. 3) Prevention of viral diseases. Aerobic activities improve the immune system. It helps you to be less sensitive to various viral diseases, especially colds and flu. 4) Reduced risk of heart disease. Aerobic exercise significantly help to reduce the risk of many diseases: obesity, heart disease, high blood pressure, diabetes of the 2nd type, stroke, and certain kinds of cancer. Aerobic exercises that include the weight load, reduce the risk of osteoporosis. 5) Control of chronic diseases. Aerobic exercises help to reduce pressure if it is elevated, and control of the sugar levels in blood. If you have ever had a heart attack, aerobic classes will help to prevent relapses in the future. 6) Strengthening of the heart. A stronger heart does not have a fast beat. Strong heart more effectively pumps blood, which increases blood circulation in all parts of the body. 7) the health Maintenance of arteries. Aerobic exercises raise the level of HDL (good cholesterol) and reduce low-density lipoprotein (bad cholesterol). The arteries are clean from blood clots and remain healthy. 8) Improved mood. Aerobic exercises help to get rid of depression, depressive moods, reduce stress associated with anxiety, promote relaxation. 9) Activity and independence in adulthood. Aerobic exercises help to strengthen the muscles that contribute to excellent mobility in adulthood. These exercises also help to remain healthy brain. Just 30 minutes of aerobic exercise 3 times a week will help to keep the mind in the elderly. 10) Long life. Studies show that people who regularly perform aerobic exercise live longer than those who lead a sedentary lifestyle. Ready to become more active? Remember that you have to start very gently. If you haven’t been active for a long time or you have chronic health problems, you should consult with your doctor about what exercises you can and cannot do. If you are starting to do, do first a simple exercise. For example, you can go for a walk every morning and every evening, walking no more than 5-10 minutes. 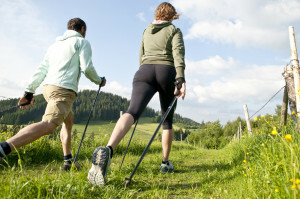 Then, the next day, you can add a few minutes and walk a little longer, gradually increasing step. After a relatively short time, you will be able to walk quick steps for 30 minutes every day. Another option – a different kind of aerobic activity that you can regularly change, for example, walk briskly, run, dance, swim, climb stairs, ride a bike and so on. If some diseases do not allow you to engage in aerobic activity, ask advice from a specialist about the alternative. If you, for example, arthritis, water exercise can do more good without giving stress to the joints.